Find the locations of low-level waste disposal facilities, high-level waste disposal facilities, and disposal facilities for waste incidental to reprocessing. The Office of Nuclear Material Safety and Safeguards (NMSS) develops and implements NRC policy for the regulation and safe management and disposal of spent fuel and HLW; develops guidance for environmental compliance, and oversees the decommissioning and cleanup of contaminated sites, safe management and disposal of LLW, and uranium recovery activities. The NRC's Regional Offices (Region I - Northeast, Region II - Southeast, Region III - Midwest, and Region IV - West/Southwest) implement these programs in the States for which they are responsible. 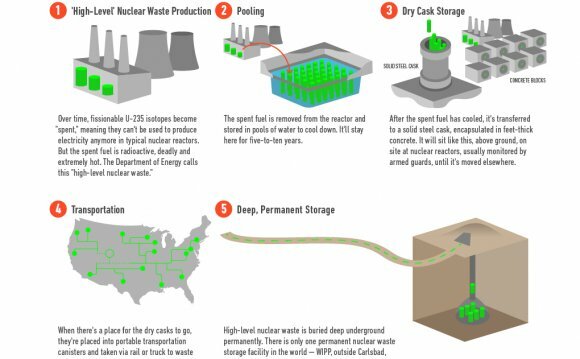 Regulation of LLW disposal is regulated by both the NRC and Agreement States, and waste regulation is also supported by the agency's Radioactive Waste Safety Research program.